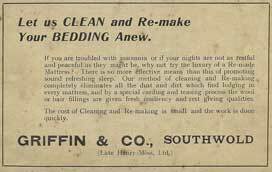 As a Griffin & Co advertisement quaintly points out in 1930, this shop "has stood on the same spot since 1669" . The facade is thought to be a Georgian addition while the shop front is Victorian. It is a Grade II Listed building. Henry Moss (Southwold) Ltd - General Furnishing (K1916). Henry Moss already runs the furnishing business across the road at 1 - 3 East Street and this is an opportunity for him to expand. Griffin & Co - Drapers (K1924). Griffin & Co have now taken over the Moss business both here and at Nos 1 - 3 East Street (selling drapery, carpets and rugs. Griffin & Co - Drapers (SRB).The Southwold Rates Book shows that Griffin & Co, like many Southwold businesses, cease trading at the outset of war. The premises remain closed for the next several years. 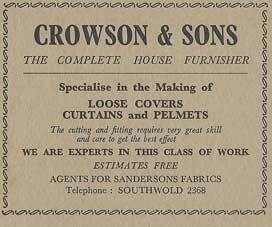 Crowson & Sons - ' The Complete House Furnisher'. See advertisement right. During this period the shop is divided into two units. Michael and Joyce Hyslop purchase the freehold of No 10, having disposed of the freehold of No 71 High Street. They establish their travel agency, Sole Bay Travel, in the right hand side of the shop, having previously run this business from No 59 High Street,. The left hand part of the shop is let by the Hyslops to Craftco, a co-operative of artists, printmakers and craftspeople. 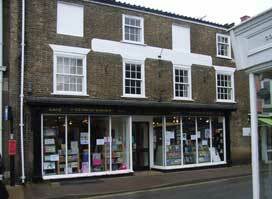 Craftco moves out and relocates to No 42 High Street. Paul Ogden, trading as 'Bookthrift, a low-cost bookshop. Paul Ogden has purchased the freehold of No 10 from the Hyslops, The latter continue to run Sole Bay Travel in the right hand side of the premises which they now rent from Paul Ogden. Sole Bay Travel is sold by the Hyslops to Norwich Airport Travel who continue to run the business from this address. Michael Hyslop dies in 1999. 'Sole Bay Travel' closes this year with the demise of its owner, Norwich Airport Travel. Paul Ogden 'Bookthrift' now expands his shop to occupy the whole premises. Premises taken over by W H Smith. Advertisement in a 1905 Southwold Tourist Guide. 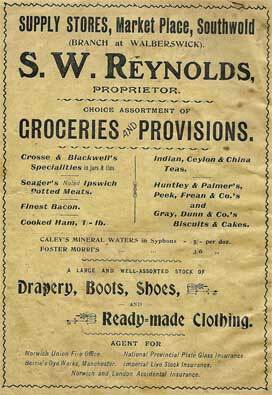 1907 advert for S W Reynolds in 'Southwold Visitors' List'. Click the image to enlarge. 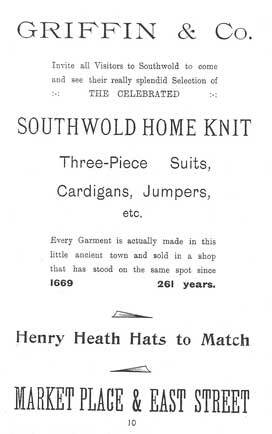 October 1926 advertisement in the Southwold Recorder. 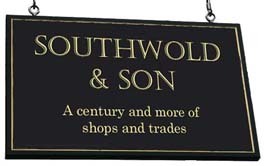 Crowson & Sons ran this advertisement in the Souvenir Programme of the Southwold Victory Celebrations in 1946. This was the year the shop reopened after the War and their stock reflects the austerity prevailing at this time. By the 1960s, the company is serving a more affluent market. Reproduced from the Southwold Golf Club Handbook courtesy of Heather Osmer. Sole Bay Travel logo, from a 1987 advertisement in the Southwold Summer Theatre programme. To see the complete advertisement, click the image.